A Breakthrough for Equity Crowdfunding. Rules went into effect in May such that anyone with the cash and interest can invest in startups through equity crowdfunding. Prior to the rule change, only accredited investors could participate in equity crowdfunding. “What this has done is really allowed for more pools of money to be available to entrepreneurs, so that’s the really big news about all of this,” says Geri Stengel, founder and president of Ventureneer, a digital media and market research company that, among other issues, specializes in crowdfunding. “Only about 1 percent of all small businesses will raise venture capital. Only about 3 to 4 percent will raise angel investment,” says Stengel, who is sitting far left on the couch.Equity crowdfunding is expected to provide a fundraising alternative for ventures such as yoga studios, restaurants or other various main street businesses. Stengel is joined on stage by Doug Ellenoff, a corporate and securities attorney with a specialty in business transactions and corporate financing who has been actively involved in working with federal government agencies as the rules are being rewritten, and Pelli Wang (on the right end of the couch), the venture director at SeedInvest, a leading equity crowdfunding platform and early-stage VC fund. To be sure, equity crowdfunding is not going to steamroll over other sorts of startup financing. “It’s not intended to replace venture capital. If you can get venture capital, God bless you. That’s wonderful, that means you are in a rarified group of profiled companies that are exciting to the VCs,” Ellenoff says. “But for many other thousands of entrepreneurs that have started up, they are only looking to find a few hundred thousand dollars, Title III (the provision of the law referring to equity crowdfunding) is a wonderful opportunity. 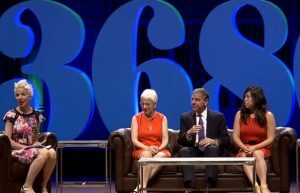 To watch the full panel – https://www.entrepreneur.com/video/277605. Article written by Cat Clifford of Entrepreneur Magazine, who acted as panel moderator. 10 Essentials of a Marketing Plan. Myth of the Millennial Entrepreneur.